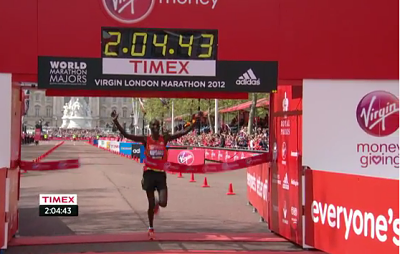 By running a stellar second half and utterly ridiculous final 10km, Kenya's Mary Keitany became the 3rd-fastest woman in history today as she won the 2012 Virgin London women's marathon in 2:18:37 thanks to a sensational 67:44 second half. 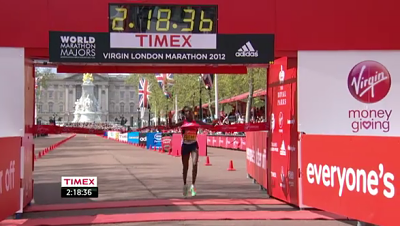 The 2:18:37 is a new Kenyan national record, eclipsing Catherine Ndereba's 2:18:47 that was set in 2001 in Chicago. Keitany and 2011 world champion Edna Kiplagat were all that were left of the lead pack when the runners reached mile 22. A 5:07 23rd mile by Keitany proved to be too much to handle for Kiplagat. But Keitany wasn't done. Her 24th mile was a mind-boggling 4:59. The 25th was barely any slower at 5:02. And with victory in sight, one might think she'd slow down to enjoy it. Not a chance. Her final 2.195 km to the finish from 40km on in was run at 5:01.3 per mile pace. 40km to finish: 5:01.3 pace. We're still trying to figure it out officially but by looking at the splits (see split chart on the right), we wrote down as the race was occurring, it seems as if Keitany's final 10km was run somewhere between 31:30 and 31:40 (See MB: Mary Keitany's Crazy Final 10km at the 2012 London marathon- 31:30? 31:45?). With an apology to Russia's Liliya Shobukhova, who is the #2 woman in history thanks to her 2:18:20 in Chicago last fall, it's clear to us that in the process of winning today that Keitany re-established herself as the favorite for this summer London Olympic marathon. Keitany had established herself as the early London Olympic favorite last spring when she defeated Shobukhova to win her first Virgin London Marathon title. However, Keitany lost the favorite's role in many people's eyes in the fall when Shobukhova ran 2:18:20 in Chicago and Keitany beat herself after going out way too fast at the 2012 ING New York City marathon last fall. 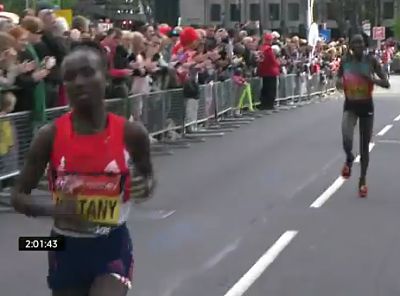 Keitany's 67:56 first half on the hilly New York course resulted in her imploding on the 2nd half of the course. Given today's performance and given the fact that Keitany beat Shobukhova here in London last spring, it's hard to argue that Keitany is not now the clear Olympic favorite. After being left by Keitany in the 23rd mile, Kiplagat held things together nicely and got the much deserved first sub-2:20 clocking of her career as she was second in 2:19:50. The battle for third was significant as it seems like it also was potentially a decisive battle for the third and final Kenyan Olympic spot. Earlier this year, Athletics Kenya had named six that were Olympic candidates and four of them, including the top two finishers, were in today's race. The other two? Well, they finished third and fourth. Daegu silver medallist Priscah Jeptoo finished third in a new PR of 2:20:14 and seemingly punched her ticket to the Olympics in the process as she defeated Berlin winner and the final Olympic hopeful from Kenya in the race, Florence Kiplagat (2:20:57). So it was certainly a good day for all of the Kenyan Olympic hopefuls in the race as went 1-2-3-4 today and all broke 2:21. When Athletics Kenya is making a decision, anything is possible. Thus, we guess it's theoretically possible that Athletics Kenya might pick Sharon Cherop, who won Boston on Monday in 2:31:50, to the Olympic team ahead of Jeptoo. But Cherop's PR is 2:22:39 as compared to Jeptoo's 2:20:14 and Jeptoo beat Cherop head-to-head at Worlds last August when Kenya went 1-2-3 behind Edna Kiplagat's win, Jeptoo's silver and Cherop's bronze. The women's race finished in sensational fashion but it started a bit slower than expected as the first two miles were run in over 5:30 and the first 5km was covered in 16:50 (2:22:03 pace).The first four 5km splits were all very even (between 16:46 and 16:51), as shortly after 20km a pack of eight women went through halfway in 70:53. After 20km, the screws would be tightened all the way to finish as each successive 5km segment would be faster than the previous. A 16:23 fifth 5km was followed up by a sixth in 16:16. The split at 30k (1:39:53) meant the runners were on 2:20:29 pace and five women were still in contention - the top 4 finishers plus Kenya's Lucy Kabuu - a 2:19:34 performer in Dubai earlier this year. The pace would get faster to the finish and soon Kabuu was dropped as the seventh 5km segement was run in 16:08. Keitany was only getting going at 35km, as her eighth 5km segment was of course the fastest of the day - 15:45. Kabuu would end up fifth in 2:23:12. The first non-Kenyan was Ethiopia's Aberu Kebede, who stayed with the leaders through 25km. Kebede, the 2009 World Half Marathon bronze medallist, who was the 4th Ethiopian finisher earlier this year in Dubai in 2:20:33, saw her Olympic dreams fall by the wayside with her 2:24:04 6th-place showing today. The seventh placer was the first non-African finisher in Germany's Irina Mikitenko, who ran 2:24:53. Not too shabby for a 39-year-old, although it looks like her days as a contender for major titles is now finally a thing of the past as Father Time has seemingly caught up to her. "There is a chance that they (the selectors) might take into account I ran a good time in New York on a hilly course but I think that won't be the case. I am not holding my hopes up for that. I'll turn my attention to trying to qualify on the track. That's what I am most familiar with. It's only the situation I am normally in every summer." We believe Keitany's final 10km was the best final 10km in women's marathoning history. Research shows that it definitely was quicker than Paula Radcliffe's final 10km when she set her world record of 2:15:25 in London in 2003 as shown by the chart below. It's worth noting that Keitany's second half marathon of 67:44 was slower than Paula Radcliffe's 67:23 from that year. Top 20 results appear below plus a side-by-side comparison of Keitany's final 16 miles versus Paula Radcliffe's final 16 miles from 2003. LRC A New #1: Wilson Kipsang Destroys One Of Greatest Marathon Fields in History (updated) In his first marathon major, Kipsang certainly wasn't scared of the bright lights as did something unheard of in major marathoning in the year 2012. He took off before half-way and used a 14:09 fifth 5km to obliterate the lead pack as a 1:02:12 halfway wasn't fast enough for him and he went to earn the largest margin of victory in 30 years as Martin Lel was second. We recap it and speculate as to who gets the Kenyan Olympic spots and tell you why a DNF in our minds is a positive for someone's Olympic hopes.